March Madness – Roller Derby Style! I know, I know. 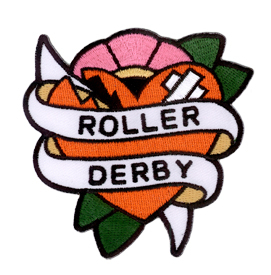 When you hear March Madness, you usually thinks of basketball but judging by the sheer number of roller derby events we got going on just in the first few weeks of March, I think that’s going to change. There’s derby bouts going on everywhere. You’d be hard pressed to find a corner of the country that doesn’t have a bout happening. We are, of course, so proud to be part of the national roller derby movement and encourage everyone to go out and support this grass-roots, DIY sport that’s on the rise. Look for another list towards the end of the month featuring more derby madness! Roll on guys and gals, roll on! All Girl Flat Track Roller Derby Bout – Prescott, Arizona Come on out as Prescott’s hometown roller derby girls bring another Arizona State Conference game!! NAZRD Whiskey Row-llers will be taking on Tucson’s Copper Queens in a hard hitting fast paced game of roller derby. Bleeding Heartland Roller Derby Main Event – Bloomington, Indiana Come Watch this double header roller derby event between the Bleeding Heartland Roller Girls vs. Ohio Roller girls. Demolition City Roller Derby: The Good, The Bad, and The Ugly – Evansville, Indiana To paraphrase Clint Eastwood, in the roller derby world, there are two kinds of people: those who hit, and those who get hit! The hits will be good, bad and ugly at the Veteran’s Memorial Coliseum in Evansville, as the rollergirls from Demolition City Roller Derby host arch-rival Black-n-Bluegrass in a wild derby showdown. Moonshine Massacre – Redding, California Join the Redding Rollergirls as they bout against the Golden State Rollergirls for this high action Roller Derby event! Roller Derby – North Las Vegas, Nevada The American Roller Skating Derby is proud to announce that Jim Fitzpatrick’s World Champion San Francisco Bay Bombers are coming to Las Vegas to take on Mizz Georgia Hase’s Brooklyn Red Devils and Ice Box’s Los Angeles FireBirds in a wild 3 team tournament. Fun and excitement for the entire family! Roller Derby Bout – Stockton, California Over five years of hard work has paid off for the Port City Roller Girls, Stockton’s only Roller Derby league as they are into their 6th Season. They are ready to share with their community what they have learned from long hours of practice and some painful bruises as they take to the track to play an intense, fast-paced sport against other women’s athletic organizations. PCRG is owned and operated by the skaters, for the skaters. It is the motto of the flat track roller derby revival that’s been sweeping the country over the past several years. In this bout,the Port City Roller Girls will face off against South Coast Roller Derby. LA Ri-ettes vs. New York Gotham Girls – Los Angeles, California Are you ready for some All Women’s Bank Track Roller Derby action? Then purchase your tickets now before they sell out to see the LA Ri-ettes take on Gotham Girls Roller Derby from New York. At the LA Derby Dolls – Doll Factory located in LA’s Historic Filipino Town. Trey Sandusky will be singing the national anthem. ATTALOSS will be performing at half-time in the Vendor Village. Tags: Abilene Derby Dames, American Roller Skating Derby, Arch Rival Roller Girls, Arizona Rollergirls, Assassination City Roller Derby, Assault City Roller Derby, Barry County Black Heart Maidens, Battle Creek Cereal Killers, Bay Area Oakland Outlaws, Beach Brawl SK8R Dolls, Bellingham Roller Betties, Bleeding Heartland Roller Derby, Brooklyn Red Devils, Cap City Wild Childs, Cape Girardeau Roller Girls, Charlottesville Derby Dames, Chautauqua County Roller Derby, Chesapeake Roller Derby, Cleveland Firestarters, COMO Derby Dames, Copper Queens, Cowtown Butchers, Crossroads City Derby, CT Stepford Sabotage, Darlings of Destruction, Dead Girl Derby, Demolition City Roller Derby, Detroit Derby Girls, DuPage Derby Dames, Eastside Derby Girls, Eerie Roller Girls, El Paso Roller Derby, Enid Rollergirls, Flat Out Roller Derby, Floral City Roller Girls, Forst City Derby Girls, Ft. Wayne Derby Girls, Garden State Rollergirls, Gate City Roller Girls, Golden State Rollergirls, Gotham Girls Roller Derby, Hellions of Troy, Hooved Animal Humane Society, ICT Roller Girls, Jacktown Derby Girls, Junction City Roller Dolls, LA Derby Dolls, LA Ri-ettes, Lansing Derby Vixens, Lawton Rollergirls, LCHR Bruisin' Betties, Long Island Roller Rebels, Los Angeles Firebirds, Mad Rollin' Dolls, Maine Roller Derby, Mclean County Missfits, Meno Mayhem, Mid MIchigan Derby Girls, Minnesota Roller Girls, Mountain Town Mayhem, Nashville Junior Rollergirls, NAZRD Whiskey Row-llers, New Hampshire Roller Derby, NOVA Roller Derby, Ohio Roller Girls, Old Capitol City Roller Girls, OPCDG, Palmetto State Rollergirls, Paper Valley Roller Girls, PCDD, PIkes Peak Derby Dames, Port City Roller Girls, Queen City Roller Derby, Rainy City Roller Dolls, Redding Rollergirls, Redstick Roller Derby, Resurrection Roller Girls, Rhode Island Riveters, Rock Star Roller Derby, RRRG, Rubber City Rollergirls, Sacred City Derby Girls, San Diego Derby Dolls, San Francisco Bay Bombers, Sandusky Roller Girls, Savannah Derby Dames, Sick Town Derby Dames, Slalughterhouse Derby Girls, Southern Oregon Roller Girls, Springfield Rollergirls, St. Baldrick, Star City Roller Girls, Tampa Bay Derby Dames, Tampa Bay Men's Roller Derby, The Un-Dead Betty's, Trapeze School New York in Chicago, Triton Troupers Circus, Tulsa Derby Brigade, Twin City Knockers, VCDD, VCDD Vendolls, Wasatch Roller Derby, West Coast Derby Knockouts. Roller Derby had a great year in 2011. The derby community had its first international competition at the Derby World Cup last month and the sport continues to grow and expand. You see more men’s leagues and banked track derby than you did this time last year and derby leagues are popping up in every corner of the country and now, the world. No doubt, we’ll see more great things for derby in 2012 and Brown Paper Tickets hopes to be there every step of the way. Derby has helped us grow into the international company that we are today and we’re proud to be the preferred ticketing service for the derby community as it grows into an international sport. Tags: Apple City Roller Derby, Arch Rival Roller Girls, Assassination City Roller Derby, Barry County Black Heart Maidens, Battle Creek, Black Hills Aces 'n Sk8s, Bonnie D. Stroir Training Camp, Brew City Roller Derby, Brooklyn Red Devils, Burning River Roller Derby, Central Vermont R, Chemical City Derby Girls, Chicago Outfit, Chippewa Valley Roller Girls, Deep Valley Belligerents, Demolition City Roller Derby, Derby Vermont Roller Derby, Desert Dolls Roller Derby, Detroit Derby Girls, Dockyard Derby Dames, DuPage Derby Dames, Eastside Derby Girls, Elm City Derby Dames, Emerald City Roller Girls, Floral City Roller Girls, Grand Raggidy Roller Girls, Green Mountain Derby Dames, Greenville Derby Dames, Hellions of Troy, Iron Range Maidens, Jet City Rollergirls, L.A. Derby Dolls, Lane County Concussion, Lansing Mitten Mavens, Los Angeles Firebirds, Mad Rollin' Dolls, Minnesota Men's Roller Derby, Missle Mountain Roller Derby, Mitten Mavens Roller Derby, Northwest Arkansas Roller Derby, Ohio Roller Girls, Oklahoma Victory Dolls, Port Scandalous Roller Derby, Puget Sound Outcasts, Rainy City Roller Dolls, Rat City Roller Girls, Richland County Regulators, Rockford Rage, roller derby, San Diego Derby Dolls, San Diego Wildfires, San Francisco Bay Bombers, Sin City Rollergirls, Slaughter County Roller Vixens, South Bay Derby Mizfits, South Bend Roller Girls, St. Louis Gatekeepers, The Bath City Roller Girls, The BisMan Bombshellz, The Oly Rollers, Tulare-Kings Derby Girls, Tuscon Roller Derby, Wasatch Roller Derby, Windy City Rollers. The holidays are almost upon us and what better way to celebrate the holidays than taking the family to see your local roller derby league? 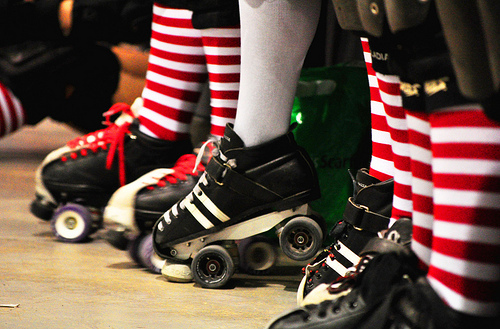 We got tons of holiday themed derby events, some fundraisers, some training events and of course, lots of bouts. Derby is always a fun and unique way to spend time with the family and your local derby teams could use your support for the upcoming holiday season. Also starting on Thursday, December 1 in Toronto, Ontario is Blood & Thunder’s Roller Derby World Cup. This is the first Roller Derby World Cup and features teams from USA, Canada, England, Ireland, Scotland, Germany, Finland, Sweden, France, Australia, New Zealand, Brazil and Argentina. Proof positive that the derby revival has become a worldwide obsession. Our Alternative Sports Doer Bob Noxious will be in the house helping out along with resident roller-girl Michelle Sunnyday (aka Sunny With A Chance of Pain of the Tilted Thunder Railbirds). This is going to be a great event where international derby teams can not only compete with each other but also network and learn from fellow derby enthusiasts. If you love derby, get your tickets here, head out to Toronto and be a part of what promises to be the derby event of the year. Tags: Ann Arbor Derby Dames, Arizona Desert Dogs, Arizona Rollergirls, Assassination City Roller Derby, Aurora 88s, Barry County Black Heart Maidens, Bath City Roller Girls, Battle Creek Cereal Killers, Big Mountain Misfits, Bililngs Roller Derby Dames, Blood & Thunder's Roller Derby World Cup, Bob Noxious, Brandywine Roller Girls, Breakneck Brawlers, Cal Skate Roller Derby, Chattanooga Roller Girls, Corporal Punishers, Crossroads City Derby, Deep Valley Belligerents, Desert Dolls, Detroit Derby Girls, Duke City Derby, Eastside Derby Girls, Farm Fresh Roller Girls, Gotham Girls Roller Derby, Grand Raggidy Roller Girls, Hardy Girls Hardy Women, Hartford Area Roller Derby, Inland Empire Derby Divas, Lehigh Valley Rollergirls, Little City Roller Girls, Main Roller Derby, Major Pains, McClean County MissFits Roller Derby, Merced's Rollin' Roulettes, Michelle Sunnyday, Naptown Roller Girls, No Town Roller Derby, North Coast Roller Derby, Ohio Roller Girls, Palm Coast Roller Derby, Pottstown Roller Derby Rockstars, Quad City Rollers, Rockford Rage, Rocktown Rollers, Rollin' Roulettes Derby Girls, Sac City Rollers, Savannah Derby Devils, Shoreline Roller Girls, Sin City Rollergirls, Sis-Q Rollerz, SoCal Derby, Sonoma County Roller Derby, South Coast Roller Derby, State College Area Roller Derby, Strong Island Derby Revolution, The Black Heart Maidens, The Dire Skates, The Mitten Mavens, The River Brats, The Roll Miners, The Undead Betties, Tilted Thunder Railbirds, Tragic City Rollers, Tulsa Derby Brigade, Tuscon Roller Derby, Ventura County Derby Darlins, Walla Walla Sweets Roller Girls, Women's Flat Track Derby Association.